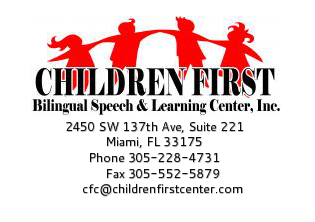 Children First Bilingual Speech and Learning Center, Inc. is a privately owned and operated speech language pathology and occupational therapy center serving the Miami Area. Our Center offers therapy in our office and/or in the patient’s natural communication environment (daycare or school) using a family-centered approach. All of our therapy sessions include therapist feedback, support, and strategies for parent/caregiver follow-up. All treatment sessions are one-on-one to focus on the patient’s Plan of Care and maximizes speech, receptive/expressive language, and occupational therapy development. All of our Speech Language Pathologists (SLP) and Occupational Therapists (OT) at Children First are nationally licensed and certified, as well as licensed to practice in the state of Florida. All SLP’s at our Center have Master’s degrees and have been awarded the Certificate of Clinical Competence from the American Speech-Language-Hearing Association (ASHA). Our Speech Language Pathology Assistants have Bachelor’s degrees, are licensed to practice in the state of Florida, and are under the direct supervision of our certified Speech-Language Pathologists and Director. All OT's at our Center have Master's degrees and have been awarded the National Board for Certification in Occupational Therapy (NBCOT). Our Occupational Therapy Assistants (COTA) have degrees in occupational therapy and are NBCOT credentialed. Dr. Ochoa is a Nationally and State of Florida licensed and certified Bilingual Speech-Language Pathologist with over 15 years experience in both private and public educational settings. She was awarded her Bachelor of Science degree in Elementary Education with ESOL Endorsement and a Master of Science degree in Speech Language Pathology with a specialization in Medical Pediatrics from Florida International University. She was awarded her Doctorate degree in Education (EdD) with a minor in Autism Spectrum Disorders from NOVA Southeastern University. Dr. Ochoa was recently featured on Univision's "Mamas al Rescate" segment of "Despierta America" Click here to watch! Ms. Ochoa a Nationally and Florida state certified teacher. She is also a State of Florida licensed Bilingual Speech-Language Pathology Assistant. She has over 13 years experience in both private and public educational settings. Ms. Jacqueline Ochoa was awarded her Bachelor of Science degree in Elementary Education and a Master of Science degree in Reading and Language Arts from Barry University.